The Brondell H2O+ Circle reverse osmosis water filtering system has a small and compact design, so you will be able to install it under a normal sized kitchen counter. In the following review, we will discuss the pros and cons of using this unit, as well as its efficiency. The compact design not only saves space, but it also helps you with the installation. All the lines are color coded, so even people who usually don’t get involved in DIY projects will be able to install this unit quickly. 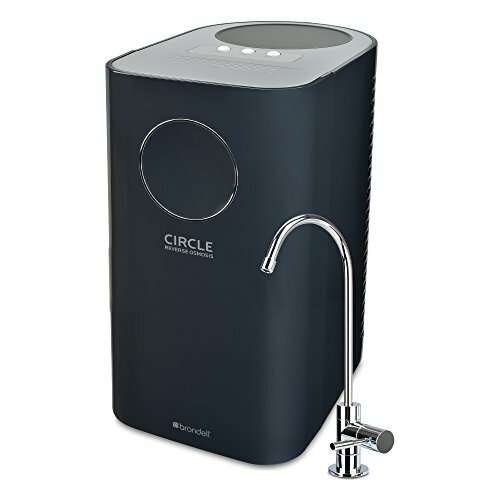 Unlike most of the reverse osmosis systems developed by the competition, the Brondell H2O+ Circle does not use pumps or electricity, so it’s more environmentally friendly and cheaper to use. 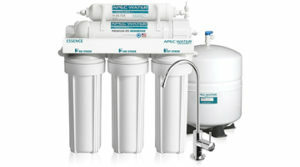 The filters used by this reverse osmosis system is are easy to change, and you don’t need any tools for this operation. There are four different filters, each one capable of reducing sediment, chemicals, heavy metals, dissolved solids, chlorine, microorganisms, and tastes or odors. Another great thing about this model is that it comes with a designer chrome faucet. The faucet looks good, and it also has an integrated LED light which will notify you when a filter change is needed. This reverse osmosis (RO) system has an efficiency of 2.1:1. This means that on average 2.1 gallons of wastewater are produced for every gallon of pure water. This might seem like a large quantity of wastewater, but it actually isn’t. Some RO filtering systems can produce up to 24 gallons or more of wastewater for ever gallon of filtered water, so 2.1 gallons is really good. This filtering efficiency will actually save you money in the long run. In addition, this system’s refill rate is faster than that of other models, almost equally as fast as that of the models using electric pumps. The Brondell H2O+ Circle reverse osmosis system uses a four-stage filtration system. All the four water filters are easy to take out and replace, and you won’t need any tools for the filter change. Three of the filters have to be changed every 6 months of continuous use, and the LED indicator installed in the faucet will notify you when the time comes. The reverse osmosis membrane filter has to be replaced every two years. This filter is as easy to change as the others, but it’s more expensive. Changing the membrane filter costs more than all the other three filters combined, but this is understandable since the reverse osmosis filtering wouldn’t be able without the membrane. These filters are also very efficient. They are capable of purifying even the foulest of water sources, without wasting a lot of water in the process. The filters will remove most of the total dissolved solids (TDS), pesticides, heavy metals, herbicides, volatile organic compounds (VOCs), fluoride, bad odors and tastes from the water. The small and compact design of the Brondell H2O+ Circle makes it easy to install. The filtering system only needs some assembling when you take it out of the box, and the instructions manual will provide valuable information for the installation process. The fact that the filters have a twist and seal construction also helps because you will be able to install them in a couple of minutes. All the connections are color coded and with the help of the installation instructions, you will be able to have the unit running in under one hour since you opened the box. This filtration system doesn’t need electricity to run, so you can install it under a kitchen counter without worrying that the power outlet is too far away for the power cord to reach. This RO system comes with everything you need for the installation. However, you should keep an adjustable wrench and a drill close at hand. You might need them for the wastewater connection. The advantage of having a compact design is that there are no cables and lines that might become tangled under the sink, so you won’t have any problems when it comes to changing the filters. No Electricity Needed – This filtering system doesn’t need electricity to work. This is an advantage because it will save you money in the long run, and it will also allow you to install the system without drilling holes in the kitchen counter for the power cord. Efficient – With a wastewater production of 2.1 gallons for every gallon of pure water, this model is considered efficient. Compact Design – There are many advantages of having a compact design. You will save some space, it’s easier to change the filters, and the system is easier to install. Poor Intake Valve – The intake shutoff valve is not good. The handle is small, and the valve itself seems very fragile. Hard To Find Filters – Unlike other manufacturers who sell their filters through Amazon and other platforms as well, Brondell only sells the filters through their own website.